KIEV, February 7. /TASS/. Ukraine’s Central Election Commission on Thursday turned down a request for registration as presidential candidate filed by lawmaker Nadezhda Savchenko, who has been under arrest for the last ten months. "Having considered the submitted documents, the commission established that they do not correspond with the election law and refused to register Nadezhda Viktorovna Savchenko as a candidate in the upcoming Ukrainian presidential election," the election authority said. Ukrainian News Agency reported that Savchenko’s failure to pay the necessary deposit of 2.5 million hryvnias ($92,700) was one of the reasons why her bid was turned down. 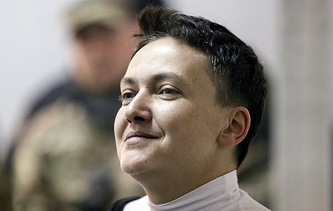 Besides, the commission noted that Savchenko, nominated for the upcoming presidential race by the movement headlined ‘Social and Political Platform of Nadiya Savchenko’ on January 26, has been under arrest on suspicion of terrorist activities. Ukraine’s top election authority also denied registration to Dmitry Pavlichenko, who was found guilty of killing a judge and sentenced to life in prison, but was released in 2014 after the country’s parliament deemed him a political prisoner. According to the commission, he also failed to post the required deposit. The presidential election in Ukraine is scheduled for March 31. To date, the Central Election Commission has registered 42 people as candidates. The deadline for submitting the bids expired on February 3. All requests are to be considered until February 8.